This book documented a study of the Pittsburgh rail infrastructure and recommendations to improve service. The lead image of the B&O Stores warehouse was a big find. It was located along the Allegheny yard branch that ran along the Allegheny River across from downtown Pittsburgh. This large building spanned most of the area between the Seventh and Ninth Street bridges. 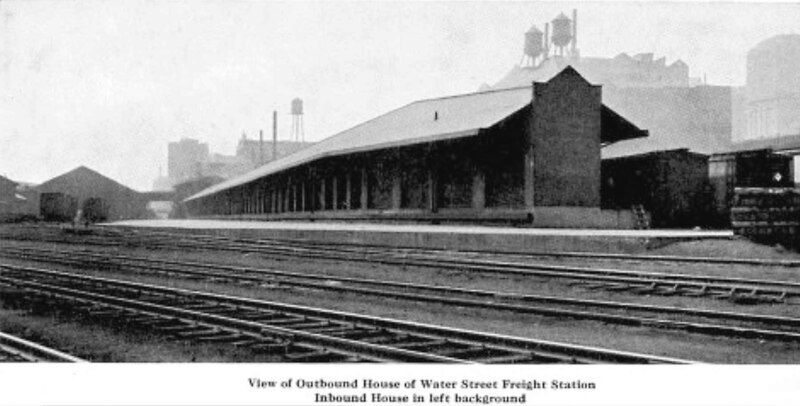 This image provides a rare glimpse of the Allegheny depot; the darker long building elevated above the rails to the right of center. And yes, those are H.J. Heinz pickle cars to the right. The main plant was served by the branch and just upriver from this location. 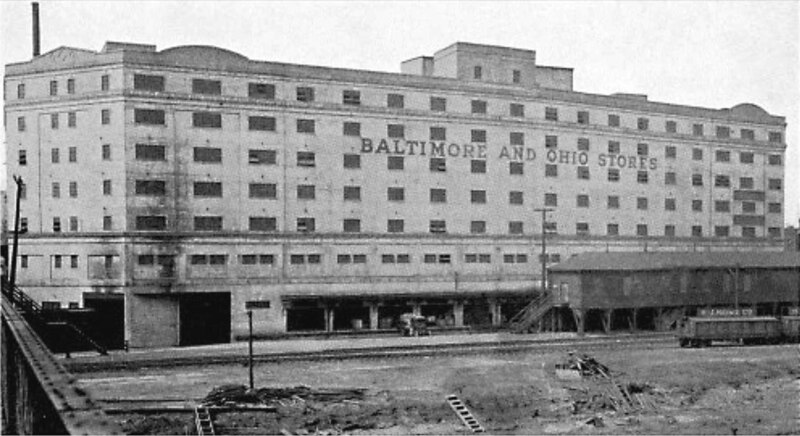 Data from a 1922 B&O Form 6 book of agents, stations, sidings, and mileage indicates the building had a few tenants and a capacity of 12 cars for loading and unloading. A plat map of the facility is featured on another page of the book and it clearly illustrates three tracks entering the structure. The plat is a little confusing as it also includes the drawing of a recommendation to expand the facility by filling in part of the river and building on this new land. I’ll bet the B&O reaction to this proposal was very interesting. 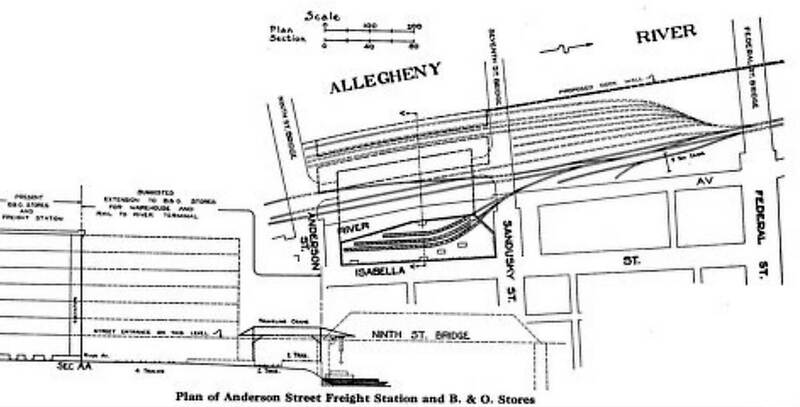 The book also included an image of another B&O freight facility that was along the Monongahela River an part of the combined passenger and freight terminal. This is the outbound house for the team yard, which is partially seen to the right of the structure. An equally sized inbound house is out of the image. In the left background is the hazy shadow of the huge freight house that had four covered tracks. I’ve seen very few photos of this large facility. A plan of the facility was also featured in the book. This would make for a busy model railroad. 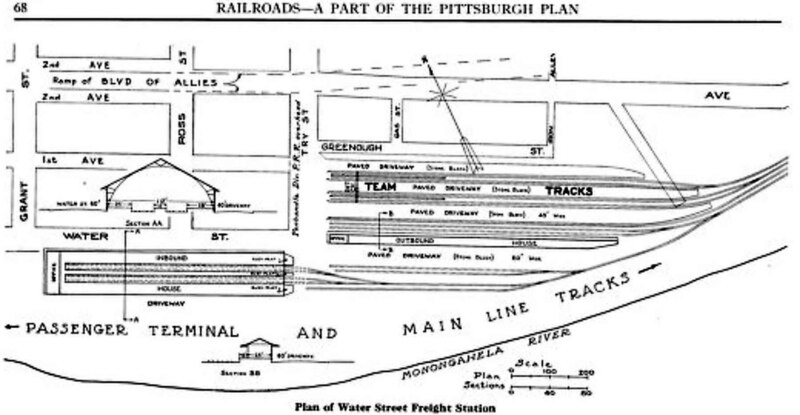 The report is a comprehensive review of Pittsburgh rail facilities, many of which are long gone. It’s a fascinating look back at a city that has transformed several times over the years. Thanks for visiting the blog. Share a comment in the section below. Please follow the instructions so your comment can be posted. All comments are reviewed and approved before they appear. Please share the blog link with other model railroaders.